As usual, these are formulated with Amazonian clay, and without parabens and phthalates. Each pan comes with 0.158 oz of product, compared to full size at 0.2 oz for $26 USD/$31 CDN. ....and one bronzer shade in 'Park Ave Princess'. These are different, as they are incredibly soft, silky, and buttery (like high end eyeshadows), and they're incredibly pigmented. - Long wearing, and natural looking! 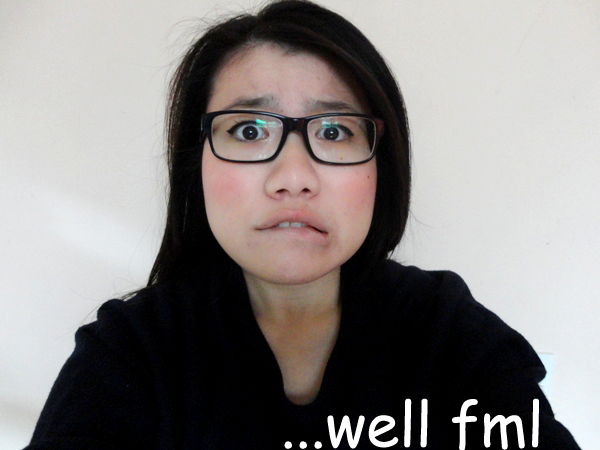 All these shade have lasted me throughout the day, and none are 'over-the-top-omg-must-blend-5ever'. They're all quite blendable and natural looking, which is always appreciated in my books. - Good variety of shades. 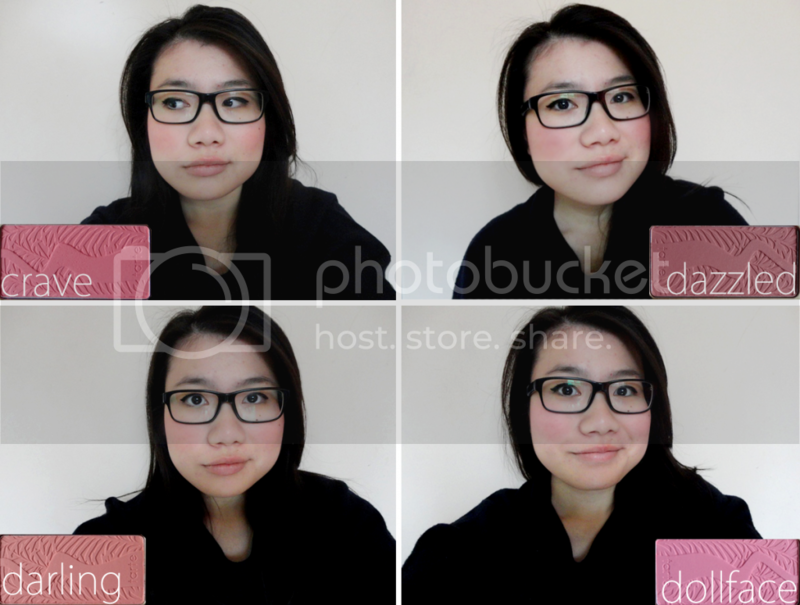 You've got 4 blush shades that are very distinct from each other, which means you can achieve more looks, and even blend them up for a unique shade! - The exterior is a shimmery, textured fabric, and while there is minimal shimmer/glitter fallout, it still bugs me sometimes. - Going on the previous point, I can see the exterior collecting dust since it is fabric, which would be a problem if you keep your makeup out/uncovered. - 'Dollface', 'Dazzled' and 'Park Ave Princess' are the only shades sold in the regular line, which means if you finish 'Crave' and 'Darling', then...you're going to weep for a while. Great review Vanessa!! ^_^ I remember seeing this in your previous haul post, i was hoping you'd do a further review on it! I've never tried Tarte before, but that's a really great price for 5 shades! The quality looks great as well and very pigmented! The colour Crave looks really nice on you hehe! Awesome review! 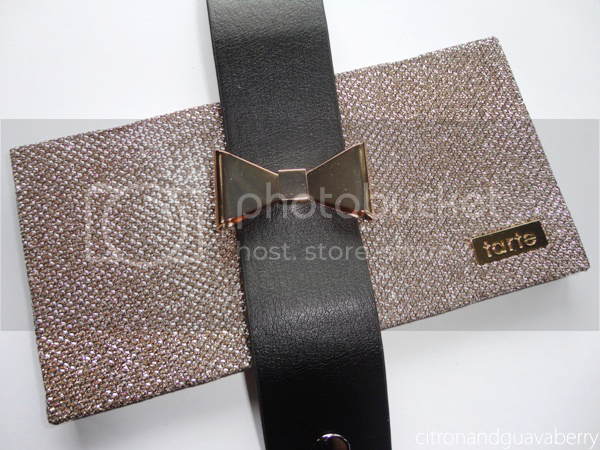 :) I love the pretty packaging! 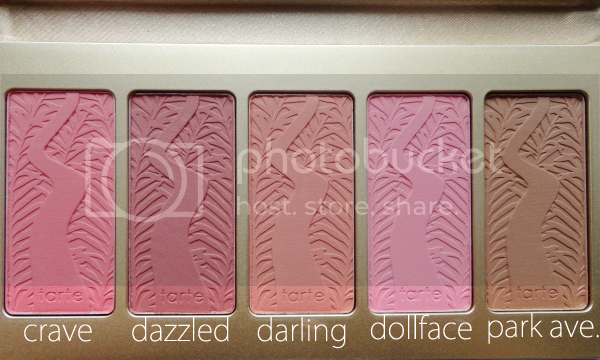 my favorite blush of all time is the Tarte one in Natural Beauty, and this palette looks AMAZING, may just have to pick it up as a gift for myself! Ahh, hopefully you do, it's a good deal if you really like Tarte blushes! Yeah, it is pretty inexpensive compared to buying just one! The shade "darling" looks really nice. The packaging would definitely be better without all the glitter. Ah I wish that I could get my hands on Tarte products in the UK. Ahh, we want what we can't have--hopefully they'll have Tarte there soon! As always, great review! This palette looks so lovely too! This blush palette is so very covetable between the cute packaging and the gorgeous shades of blush. It does sound like a really good value too! Why are you tempting me so with this rave review ?!! I have the Tarte blushes in Amused and Exposed. The latter is my everyday go to color and I totally concur with you on the pigmentation and wear. 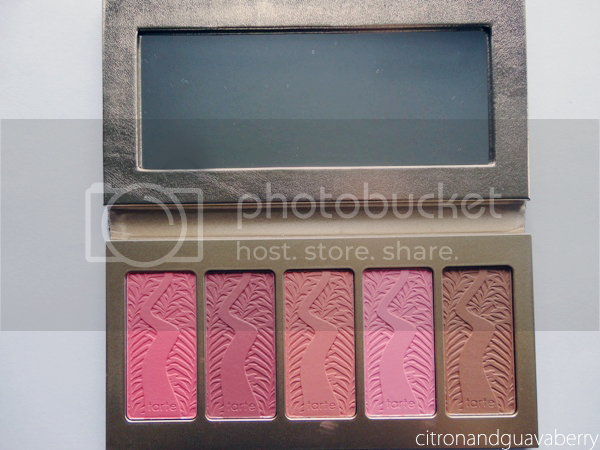 I really want the new nars blush palette!!!! I would totally buy this, but my tarte blushes dried out (if that makes any sense) after around 8 months. When I bought them, they were heavenly! I would be too worried about this palette drying out too! Gaaahhh! It looks so lovely though! That actually makes total sense! The ones in the palette are super soft, but the samples/display ones are really tough, so it does make sense that they 'dry out'! Darling looks gorgeous and you really suit Crave. I think this palette is gorgeous! I would sooo use the first three shades a lot, they are sooo me. At 4 grams a blush, that decent but the price is a bit pricey! hahah. wow. yes,, you've made me want this. but i think dazzled is also in their permanent line no? you probably encounter hard rock blushes at sephora b/c everyone keeps touchng them and they're just sitting out in the open. 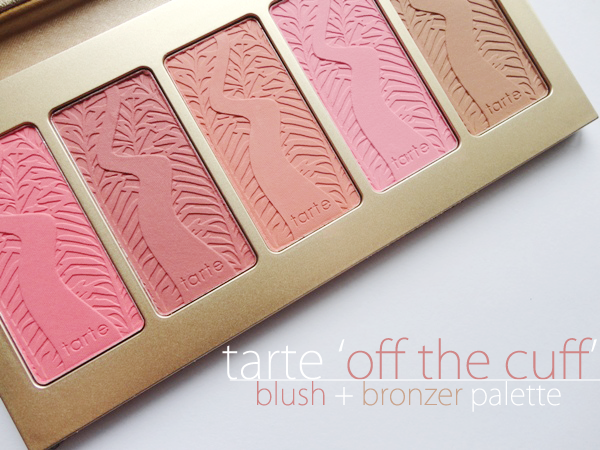 i' really want to pick up tarte's exposed..i keep lusting after this one and have been putting it off for years. I will do next week i swear!! Such a lovely little palette! Cute shades, too. I love the 1 and 3 on you most. oooo the design is soo pretty, like youu!! <33 hahah <-- sounding sooo creeperish..! LOLLLL FLORA, YOUR MESSAGES CAN NEVER BE AS CREEPY AS MY MESSAGE IN YOUR YEARBOOK ._. FIRST OF ALL VANESSA Y U SO PWETTY?!? hdfjdjfdaue you're actually soooo beautiful, DAT DOLLFACE wow gurl! This is such a good review! I haven't ever tried any tarte blushes and this palette seems like a good way to try out a few of them! I really like the look of darling! I like dazzled on you the best. It looks naturally sun-kissed. This set sure is expensive but from the way you described the texture, they sound lush. Haha, thankyou! Yeah, the set is expensive, but the texture is pretty incredible. Finely milled powders ftw! 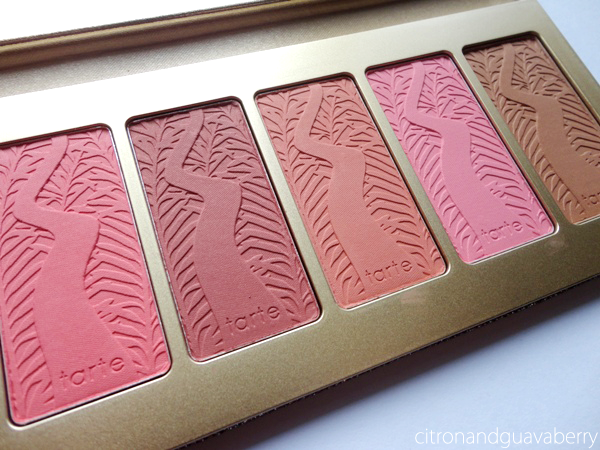 I've been lusting over this one by Tarte! Your swatches have got me swooning! ive never wanted this palette so much until i saw it reviewed in temptalia earlier today! amagad im so jealous. the palette is so so nice. also i get what you mean with this kind of texture interior. its like my UD palette its so nice at first then so dirty after awhile lol. YEAH!!! That's kinda why I don't want the UD palette, because I know my room can get hella dusty! AHHHHHH I WANT THIS SO BAD NOW! I was looking at another tarte holiday set where there were three different blushes that are a smaller size and are cheaper as a package, but then i did the math and realized that youre getting more product for dollar if you bought the full size. This looks like a good deal because there are so many different colors! Oh yeah, I saw that set too! It does look like a good set though, considering they're singles and easier to carry, but yea, this palette is the better value!! Great review. I want! haha. I think I like Dazzle and Darling the best, but they are all pretty. I was initially sticker shocked, but it's a pretty good deal once you think about it!